Parents have repeated the saying “beauty is in the eye of the beholder.” for years. But these parents didn’t spend a lot of time in Miami! Beauty is obviously in this sultry city! 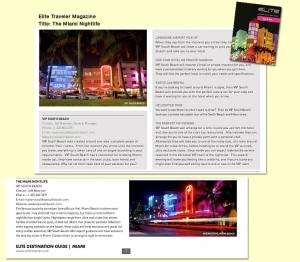 It’s on the beaches, in the shopping centers and is very prominent in the South Beach nightclubs! If you are hoping to catch a glimpse of some of this “eye candy” or are a beautiful person yourself, this is where you need to be seen during your next vacation! 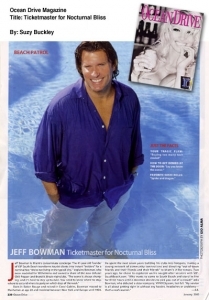 To get into the best nightclubs, have a club concierge like Jeff Bowman schedule your reservations for the amazing Miami Party Package they offer or VIP bottle service. Owner of VIP South Beach, Bowman can arrange for your name to appear on the hot lists that the doormen hold outside the velvet ropes. For more information call 305 804 5071 or visit www.vipsouthbeach.com. The famous quote by comedian Lenny Bruce that ‘Miami Beach is where neon goes to die’ may still hold true in some respects, but there is more to Miami nightlife than bright lights. Nightspots range from ultra cool clubs that attract hordes of celebrities to quiet, chilled out affairs that allow for peaceful reflection while sipping cocktails on the beach. Most clubs are fairly exclusive and guest list entry is often essential; VIP South Beach offer expert guidance and have access to the very top clubs in Miami. Contact them to arrange a night to remember. VIP South Beach was created around one idea: complete peace of mind for their clients. From the moment you arrive until the moment you leave, everything is taken care of and arranged according to your requirements. VIP South Beach has a reputation for knowing Miami inside out; they have contacts in the best clubs, bars hotels and restaurants. Why not let them take care of your vacation for you? When they say from the moment you arrive they mean it; VIP South Beach will have a car waiting to pick you up from the airport and take you to your hotel. VIP South Beach will reserve a hotel or private mansion for you, and have a personalized itinerary waiting for you when you get there. They will find the perfect hotel to match your needs and specifications. If you’re looking to travel around Miami in Style, then VIP South Beach will provide you with the perfect luxury car for your stay and have it waiting for you at the hotel when you arrive. You want to see Miami but don’t want to drive? Then let VIP South Beach book you a private helicopter tour of the South Beach and Miami area. VIP South Beach will arrange for a limo to pick you up from the hotel and take you to one of the city’s top restaurants. Alternatively they can arrange for you to have a private yacht with a personal chef. Afterwards they will take you to one of the many cool, chic bars around Miami for a few drinks, before heading on to one of the VIP A-listed, ultra exclusive clubs. Once inside you can expect table/bottle service reserved in the exclusive VIP room of the nightclub. This superb evening will leave you feeling like a celebrity; and if you’re lucky you might even find yourself sitting next to one or two in the VIP room. You know that the beautiful people flock to Miami’s South Beach for after-dark amusements. But do you know which clubs to hit on which nights, not to mention how to get in? Jeff Bowman does. This former model, erstwhile club owner, and South Beach insider is a concierge-plus for his tourist clients. Bowman will book you the hippest hotel room within your price range, reserve tables for you at the restaurants of the moment, and – best of all – set you up with our Miami Nightclub Party Package reservations at the right bars and nightclubs on the right nights, Itineraries include suggestions for the daylight hours, as well. VIP South Beach offers affordable pricing packages for their discerning clients. Okay, so you wish you had it all-a personal trainer, a personal shopper, a personal assistant, and don’t forget, the housekeeper. Maybe you have all of these, or maybe just one but if you are looking for something that is much more adventuresome, why not hire your own internet concierge? A trip to South Beach, Florida is the way to go because Jeff Bowman of VIP South Beach is your man. As a former model having traveled the world over, Bowman knows the ins and outs of vacationing with style. All you have to do is get on his VIP list. Write out your wish list and for a nominal fee, VIP services will reserve the hotel of your dreams, the restaurants that fit your mood, and the nightlife that waits for you to arrive. Bowman understands how valuable your time is and with his insider information, he gets you in first to the best nightclubs. Leave the details to him. The experience of being catered to is well-worth the price of the plane ticket alone. 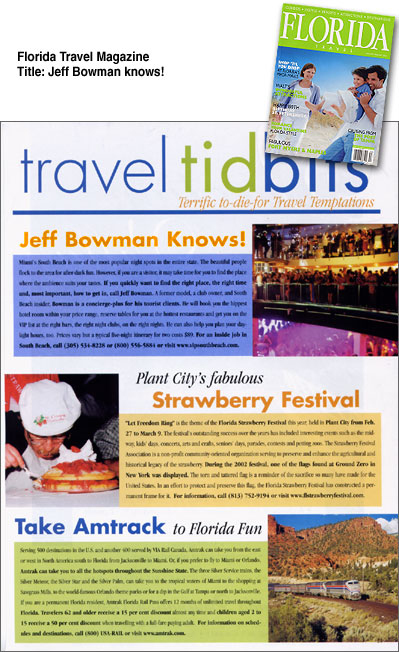 Jeff Bowman, began VIP South Beach in July of 2000 because he realized that people were not having a full South Beach experience. They were spending their valuable time hunting down the right atmosphere but going to the wrong clubs or sometimes, the right clubs but on the wrong nights. As a previous club owner, Bowman understands nightlife and is the man to know to get you in the door without a wait. 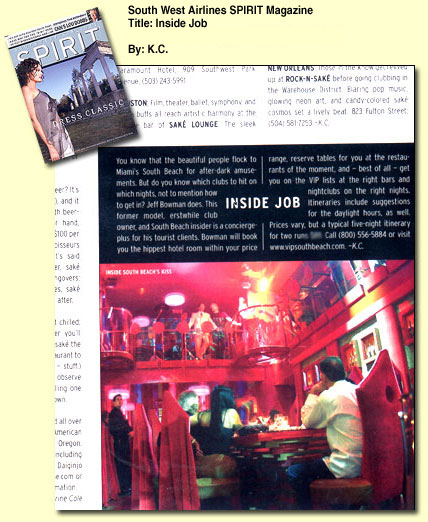 VIP South Beach has been so successful that Bowman has launched his sister company, VIP NY City in the fall of 2002. The services provided by VIP South Beach and VIP NY City have become so popular that client response alone has made Bowman’s VIP company one of the hottest tickets in town. It is the business of VIP South Beach and VIP NY City to know how to have a good time which truly can be a fine art. Such phrases as “I wish I could have found you sooner” or “Being on the guest list saved us!” are repeated by clients and fill VIP’s email. The services VIP South Beach and VIP NY City provide include setting up a personalized itinerary, finding the right style of hotel, making all reservations, putting your name on the VIP guest list at the hottest and best clubs with your own reserved table, organizing private parties as well as corporate or special events, hosting amazing bachelor and bachelorette parties, taking care of all transportation, and creating daytime itineraries if desired. With Bowman behind the wheel, no longer are these legendary cities just for the locals. VIP South Beach and VIP NY City are changing the way we vacation. Any experienced traveler knows that going first class beats coach any day. It is the business of VIP South Beach and VIP NY City to know how to have a good time which truly can be a fine art. Such phrases as “I wish I could have found you sooner” or “Being on the guest list saved us!” are repeated by clients and fill VIP’s email. The services VIP South Beach and VIP NY City provide include setting up a personalized itinerary, finding the right style of hotel, making all reservations, putting your name on the VIP guest list at the hottest and best clubs with your own reserved table, organizing private parties as well as corporate or special events, hosting amazing bachelor and bachelorette party packages, taking care of all transportation, and creating daytime itineraries if desired. With Bowman behind the wheel, no longer are these legendary cities just for the locals. VIP South Beach and VIP NY City are changing the way we vacation. Any experienced traveler knows that going first class beats coach any day. MTV Networks Consults With VIPSouthBeach.com For A New Series in Miami Beach Fl/PRWeb/ VIP South Beach, South Beach Florida’s ultimate nightlife guide was contacted by producers of MTV’s new series to set up the cast with the ultimate South Beach nightlife experience. 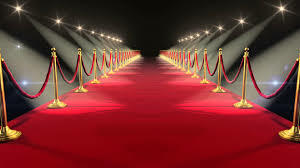 The producers want the first episode to feature the cast experiencing VIP South Beaches premier nightclub party package complete with a 2 hour open bar at a trendy lounge, limo transport to the nightclub where they would be given the red carpet treatment and walked right into the nightclub VIP style with no waiting in the long lines or huge crowds at the door. VIPSouthBeach.com is a personalized VIP service and nightlife guide specializing in creating your ultimate South Beach experience. MTV producers also contacted Jeff Bowman owner of VIPSouthBeach.com looking for the hip trendy hot spots to shoot the scenes of the all girl cast going out on the town in South Beach and being as wild as can be. Not known to the cast, their family or significant others are in disguise watching their wild nights out in South Beach Florida’s trendiest nightclubs. “We arranged a hip customized itinerary for each night based on MTV’s shooting requirements,” said Bowman. 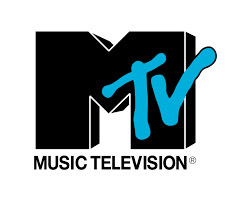 VIPSouthBeach.com provided production assistance to MTV, also providing the perfect customized South Beach VIP Itinerary for the show. 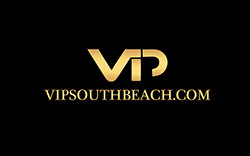 VIPSouthBeach.com is South Beach’s ultimate nightlife guide and personalized service. We provide our tourist clients with a complete customized VIP itinerary. Our itineraries include discounted hotel rates at South Beach Florida’s hip hotels, reservations at the best international restaurants and all our clients are placed on the VIP guest list at the most exclusive nightclubs and lounges, insuring immediate entry without waiting in long lines or big crowds. Each VIP itinerary is completely customized and suited to each clients individual tastes ensuring their ultimate South Beach experience. Company Name: VIP South Beach Inc.